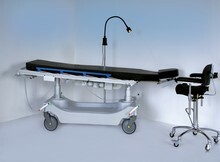 The multipurpose surgical stretcher manufactured by C.B.M. is ideal for optimum timing in carrying out operation in professional surgery. In particular: plastic surgery, ear-nose and throat surgery, hand surgery Ophthalmology and many other applications. A single stretcher is used for comfortably preparing, treating and hospitalizing the patient, minimizing the time needed for operations and reducing stress for the entire staff. The team can adjust the patient position in the most suitable way during surgery. In case of emergency the stretcher is equipped with manual and powered mechanism to bring the patient rapidly into the anti shock position.